What exactly is Skinny Fat? Skinny fat is basically a term that is used to describe a person that has high body fat and low muscle mass. Most Skinny fat people appear slim when wearing a t-shirt, but once the t-shirt is removed…you can see they have quite a bit of body fat around their waist and other less prominent areas not seen with clothes are on. Both men and women can be skinny fat. Most skinny fat men tend to carry the weight around their mid-section. Whereas women that are skinny fat usually carry most of the fat around their hips and thighs. These are usually just the stubborn areas that men and women usually have to deal with. Don’t worry the Skinny fat curse can be BEATEN! What Made Me SKINNY FAT? 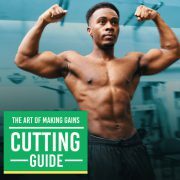 Why cardio alone doesn’t work? Many people assume to get rid of a skinny fat frame you need to do extreme amounts of cardio…but this is one of the worse things to do. This is because extreme cardio makes a person lose fat, water weight AND muscle, which will not improve your muscle to fat ratio. Weight training allows you to build a better and broader frame. This is improve you body dimensions and overall begin to beat the skinny fat curse. The extra muscle on your frame will help you burn more fat and give the appearance of a more tapered physique (this will work for men and women). Often women are afraid to train with weights as they believe they will get ‘bulky’ and ‘manly’ but let me assure you…this is not the case. In simple terms, for a woman to get to that huge masculine frame, they would in most cases need to be training hours daily and be using “additional substances” *wink wink* to be able to pile on large amounts of muscle. Another benefit of building muscle is…as we get older, our metabolism begin to slow down, but building muscle helps to keep your metabolism going and keep your body fat levels down (due to having extra muscle allows people to burn more calories even when stationary). You cannot out train a bad diet! The workout and below is a good place for beginners to start. I include exercises that should be easy to follow but will produce results. You don’t need to lift crazy heavy weights, it’s all relative. Just be sure to choose challenging weights and overtime gradually increase them. 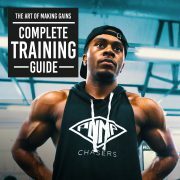 I believe a 4 day bodybuilding routine is perfect for beginners. You don’t need to kill yourself in the gym every single day! You just need to follow a structured routine and be consistent with it, then over time you will see progress. 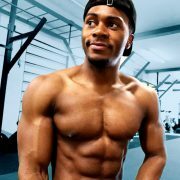 I have a created a ‘lose skinny fat’ guide from my own personal experience. 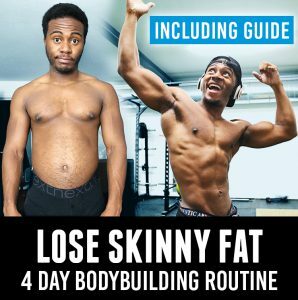 I cover how to improve your body frame and lose the skinny fat body type for good. A full skinny fat workout routine is also provided for you to follow. Remember though…diet is also key. You don’t need to train EVERY single day. Rest is important, it allows for recovery for muscle growth and also for you to get ready to conquer the next day. Give your body a break and time to recover! What SKINNY FAT DIET Should I Follow? In this journey the diet is key! If you don’t have a relatively good diet you won’t be able to build the extra muscle and lose the excess body fat you have. You don’t need to eat crazy fancy or just eat chicken and broccoli. The best thing to do is simply cut out the packaged and oven-frozen foods (most processed foods, high-fat foods, fizzy drinks and takeaway foods). You don’t have to completely avoid these foods (trust me I don’t). Simply, limit it and keep it under control. Try aim to get the majority of your carbs from fruit, vegetables, and whole grains! Aim for at least 2 pieces of fruit & veg per day. Try keep it consistent! This will also help with bloating, try aim for at least half a gallon per day (buy some half gallon water bottles, it can make it easier).